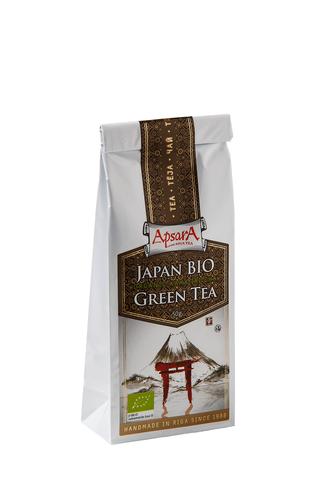 Ingredients: Japanese green tea, Kirishima, Kagoshima prefecture. Taste: light, roasted, rice and nuts. Very clean and delicate frech leaf note. Brewing instructions: Boil fresh water and cool till 80C. Take a 3-4g tea for pot 200ml and allow tea to brew 1min. Once brewing time is over, pour all tea into the cups. According to japanese style of brewing, you can make 2-3 infusions out of one portion. Features&recomendation with food: Althought taste is light you can be aware that this tea has invigorating effect. Should be served in daytime along with fruits, salty snacks or biscuits. Product highligths: Few of Japanese teas are produced first with pan firing. This metod is mostly used to Chinese green teas. In translation Kama Iri Cha sounds as “tea which has been put into the pan”.